This was a match that was always running the risk of being a little bit like after the Lord Mayor’s show. The Champions League games against Manchester City have consumed us as supporters ever since the draw was made, with the players also likely to have been distracted by it regardless of what clichés over the issue the manager trotted out in his press conferences. The He can say he only looks at the game in front of him, but his team selection for the match and substitutions during it proved the lie on that front. A draw at Goodison was a decent enough result given the context of the game in the rest of our season, but it simply wasn’t the main thing on our agenda and everyone knew it. The visit of Eddie Howe’s team was the last thing on anyone’s mind. The moment we all started concentrating on them wasn’t even until after the draw for the Champions League semi-finals was completed at Friday lunchtime. These even an argument to suggest that those in the crowd at Anfield or watching at home didn’t truly start to fully concentrate on the Cherries until the referee blew the whistle to get the match underway. After all, Roma is about the kindest draw that we could’ve got. That’s not to say that the victory should be taken for granted by anyone. You don’t come back from 4-1 down to knock Barcelona out of the completion unless you’ve got something about you. They will be tough opponents and I would actually have preferred to face Real Madrid, being totally honest. If we’re going to win the tournament then it’s likely we’ll have to beat Los Blancos at some point and I think I’d prefer to try to do it over two legs rather than one. That said, we have to fancy that we’ve got enough to get past the Italians and potentially be in our first European Cup final for more than a decade. 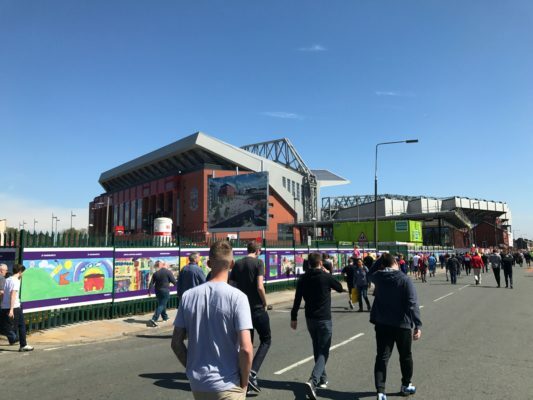 That’s a shortened version of the thoughts that most Reds will have been having since Friday, with few thinking about the return of Jordon Ibe. We all enjoyed having a good laugh at Harry Kane’s sad and pathetic attempt to claim the goal that should’ve been awarded to Christian Eriksen. The striker became something of a laughing stock on Twitter and in the football world, going so far as to swear on his daughter’s life that he touched the ball. You have to wonder what his attitude has done in the Spurs camp, with players presumably feeling as though they have to look for him at every opportunity from now on for fear of him throwing another hissy fit. I’m genuinely surprised that Mauricio Pochettino, a man who values team spirit above all else, was so willing to let Kane disrupt that spirit in favour of his personal ambition. It was always going to be interesting to see how the Liverpool players would react the next time they played. I was hoping that they’d all run to Mo to celebrate regardless off who scored. Instead they took to Twitter to lampoon the Tottenham striker. Yet it did seem to be playing on their minds on the pitch, too. On more than a few occasions they seemed to be looking for the Egyptian rather than trying to score themselves, for example. I’m reasonably convinced that that’s what was going through Roberto Firmino’s head when he was essentially through on goal but failed to put it into the back of the net. The main himself seemed to playing his normal game by taking pot-shots if he thought there was something on and looking for players in better positions when possible. He was five goals clear of Kane before the Spurs man offered up his daughter for ritualistic sacrifice in return for a goal and he’s still five goals clear of him now. The lads on the pitch need to let the chase for the Golden Boot take care of itself and concentrate on the games in front of them from now on. Do that and the top scorer spot will take care of itself. A couple of weeks ago, after Trent Alexander-Arnold had struggled to cope with both Marcus Rashford at Old Trafford and Wilfried Zaha at Selhurst Park, I said something on Twitter about him not deserving a criticism-free season just because he’s young. It might be best, I suggested, for him to make his mistakes away from the glare of the spotlight at Anfield, perhaps with a loan to a club lower down the league like Huddersfield, one that likes to try and play football. Since then Trent has been in contention for the Man of the Match award in three of our last four games. He was absolutely sensational against Manchester City at Anfield, clearly having been targeted by Pep Guardiola’s man but giving as good as he got and making a very, very talented Leroy Sane look decidedly average. I thought he wouldn’t be able to perform to the same level at The Etihad, but I was dead wrong. He was stunningly good there as well, playing most of the game on a yellow card. Any thoughts that he was simply raising his game for the Champions League were put to bed by his performance against Bournemouth this weekend. Once again he was one of the best players on the pitch, not only defending resolutely but adding an attacking prowess to his game with a really top-notch passing range. Some of them were even quite Gerrard-esque, as criticism-inviting as that might be to say. The ball for Mo Salah’s goal was absolutely sumptuous, inviting the header that made life just too difficult for Asmir Begovic and put Liverpool 2-0 up. Eddie Howe called the pass and header combination ‘unbelievable’ after the game and I think that’s a fair description. Sufficed to say, I was wrong about the city native who has made the right-back spot his own. He has learnt from every mistake he’s made, growing and developing as a player to the point where he doesn’t look out of place in a side that’s now just three matches away from another European Cup. If he keeps learning and developing at this rate then there’s no telling what his ceiling might be. There’s no question in my mind that Sadio Mané hasn’t had quite the same season in terms of impact that he had during his debut campaign. I think there are loads of reasons for that, not least of which is that he was moved over the lefthand side in order to accommodate the Egyptian King on the right. I also wonder whether the red card at The Etihad earlier in the season affected his mentality for a time. Don’t get me wrong, the stats say that he’s been delivering numbers at the same rate that he managed last time out, if not even better. For me, though, it was his first-touch and passing that were found wanting at important moments. I felt a little bit as though he was doing the difficult things without all that much bother but couldn’t pull of the easy stuff as well as he did when he first joined the club. That’s not to say that I wanted him to be dropped or sold or anything daft like that. Anyone who’s read my writing before will know that I’m a firm believer in nuance in football. A player doesn’t have to be one-hundred percent perfect all of the time in order to contribute to the team. I just felt that he was slightly lacking in what he’s been bringing to the side compared to last year. In the last few matches, however, even that has picked up. He was head and shoulders the best player on the pitch against Everton until he was substituted, ran the second-half against City and then put in an brilliant performance against Bournemouth. His goal showed what he’s all about, getting onto the end of a brilliant Jordan Henderson cross before being the quickest to react once the ball came back of the goalkeeper. He caused them trouble all the way through the game and seems to be hitting his best form of the campaign just when we need him to. On the fifteenth of April 1989, thousands of people descended onto Hillsborough Stadium to watch a football, just as thousands had done every weekend for decades. What followed was one of the worst mismanagements of a football match in the history of the English game, resulting in the unlawful killing of ninety-six people. They would never go home. Never be able to see their parents, brothers, sisters, sons or daughters again. Ever since that moment a fight has been fought to win them justice. Twenty-nine years later and that’s a fight that’s still ongoing. In a week when the debate over safe-standing was re-ignited it struck me how many things have changed because of Hillsborough that were nothing to do with the disaster – no standing at top-tier grounds, no alcohol within view of the pitch, football supporters treated differently to fans of any other pastime – and how odd it is that the actual culprits remain untouched. This is always a difficult weekend for the families of the victims of the disaster, to say nothing of the survivors who spend their lives haunted with guilt at having done nothing more than made it home. It’s a time when everyone associated with the club takes a moment to think about those that never did. We’re nearly three decades on from the terrible events of that day and for the first time in a long time the overwhelming feeling is one of hope. It feels like justice is coming at long last. We need to keep pushing, keep fighting and keep holding the authorities to account, but it’s coming. The win over Bournemouth was impressive, our advancement in the Champions League exciting. Yet we must never forget that there are some things that are far more important than football. That might be the only thing that Bill Shankly was wrong about. Justice is coming. They Will Never Walk alone.